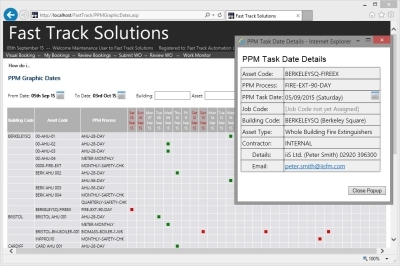 Fast Track PPM will automate operations and save staff time, by managing all areas of building and asset maintenance. The PPM system provides task distribution, monitoring, overdue warnings, SLA's/KPI's, invoicing and more. 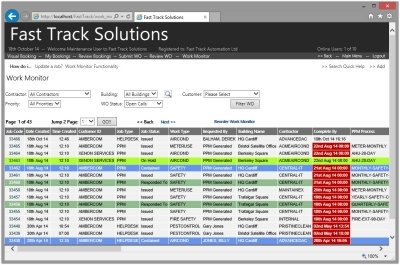 Fast Track Help Desk & PPM provide the powerful, scalable tools you need to automate your maintenance activities. Start off as standalone or a small group, and scale up to web access for service providers and customers, including self-service from anywhere. Cost, performance, SLA and KPI monitoring. The PPM software automatically distributes jobs to service providers and contractors. Fast Track Help Desk & PPM provide Real Time Access for Service Providers. No longer will you be limited to a daily service provider instructions report. Whether service providers are on your staff or external contractors, they will have live access to full requirements details, and will be notified to check their live views when there are last-minute changes. Utilising Email and Text notifications, Fast Track Help Desk & PPM keep applicable staff members and service providers up to date on all aspects which concern them. Fast Track Alerts reminds staff and service providers when new jobs have been logged, are approaching escalation and/or jeopardy, and much more. The Asset management software mechanisms mean asset performance can easily be reviewed.